The Historic Royal Dockyard Chatham offers a unique visitor experience as the world’s most complete dockyard from the Age of Sail. 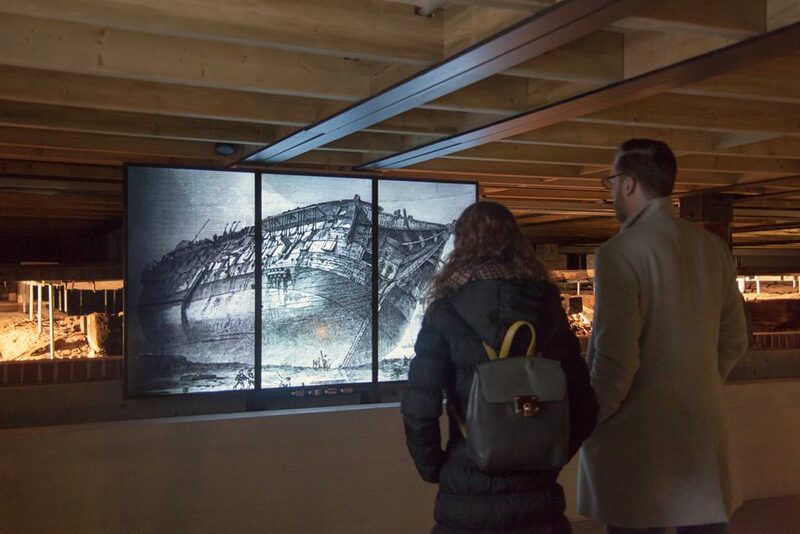 Visitors can discover the secrets of Britain’s maritime history through our media installations in three of its popular exhibitions: The Smithery, Hearts of Oak and more recently Command of the Oceans. Command of the Oceans is comprised of four new interactive galleries which explore Chatham’s trade roots, the full dockyard story, the mystery of the Namur which was a ship found under the floor and a treasure trove of archaeological objects recovered from the sea bed. 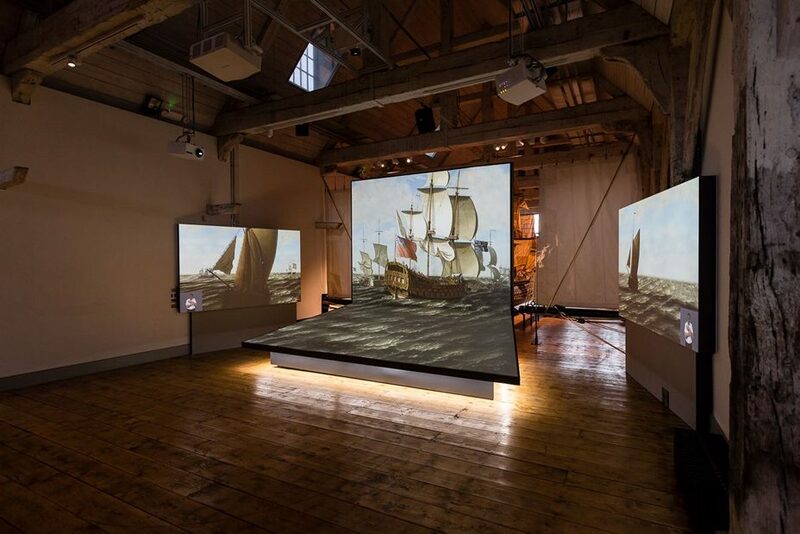 We created four films to present the dockyard’s rich history, five interactives where visitors can discover how specific objects were used on ships and custom built software for iPads that are dotted around the galleries where users are invited to discover what happened in that specific area. Championed for its progressive conservation and carefully selected new materials, Command of the Oceans has been shortlisted for the RIBA Stirling prize 2017 building of the year. 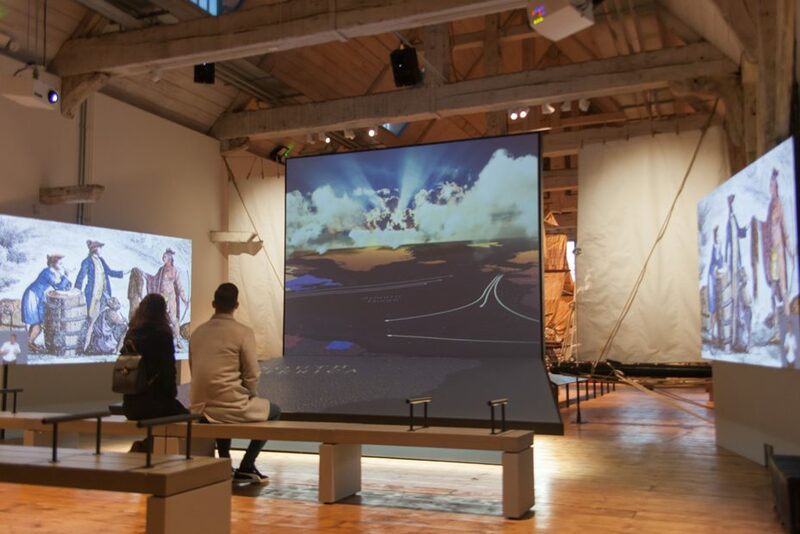 A large four-screen immersive film explains Chatham’s links to slavery, its trade roots and the changes to the dockyard over time. There is one main screen in the centre of the room which flows seamlessly into the floor projection with two screens at either side. We used projection mapping with the result that the moving image appears to go seamlessly from the wall to the floor. The discovery of the timbers of the Namur is regarded as one of the greatest of Naval archaeology in recent years. 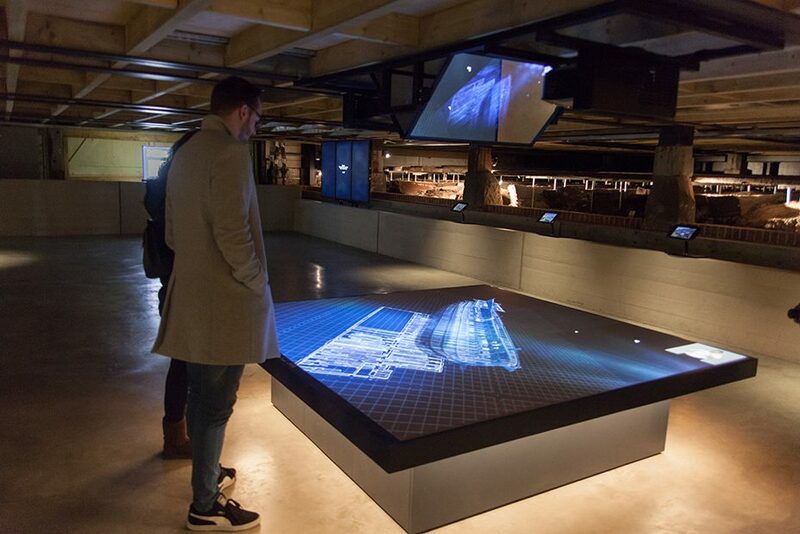 The mystery of the ship beneath the floor is explained in a 3D reconstruction projected onto a table. We also created a film presented by Fiona Bruce which plays on three large screens. Unlike most found vessels in the ocean, the Namur was stored on dry land so its details can be studied more accurately. Elements of the Namur were removed and used in other ships, however some of the timber was in too poor a condition to be reused. The film explores the reasons why the timber was kept, including its potential use as firewood or for more sentimental reasons. The room is surrounded by iPads where visitors can search databases of the people who worked on the Namur. This film presents the HMS Namur which was a Royal Navy 90-gun second rate ship, built at Chatham Dockyard. Some of Namur's timbers were used to support the floor of the wheelwright's workshop at Chatham Dockyard. The timbers were discovered under Chatham’s floors in 1995 and the enigma surrounding the reasons for their storage is further explored in the subsequent Mystery Beneath the Floor exhibit. The restored timbers form the centrepiece of the Command of the Oceans gallery. This is a short film presented by British television presenter and newsreader, Fiona Bruce. It demonstrates Chatham’s unique variety of buildings tailored to the needs of warship construction and repair. A drone was used to capture aerial shots over Chatham’s vast collection of buildings including Georgian houses used by anyone of authority in the yard and Sir Robert Seppings’ 300ft long covered slipway. The drone was also used to capture the interior of the rope walk which is an impressive quarter mile long building where the ropes for rigging ships were made. 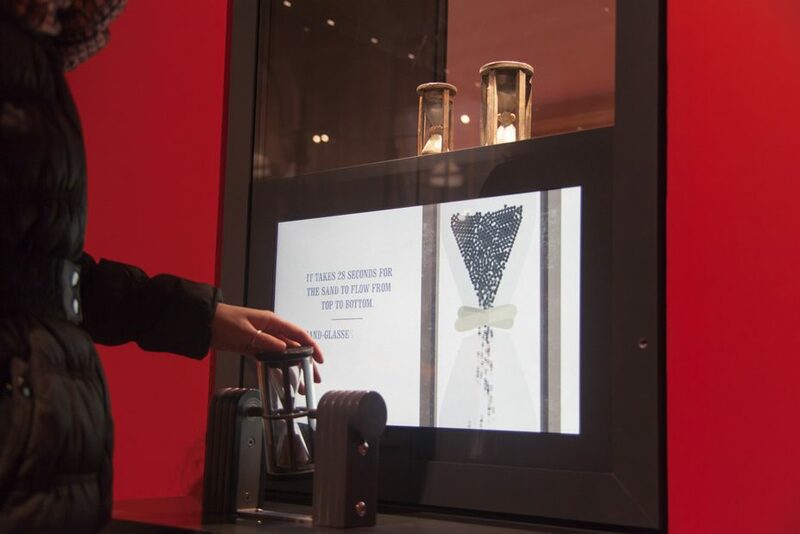 This interactive explains how sand glasses were used to measure a ship’s speed. Sailors turned the glass as they hurled a log line (a rope with knots) into the sea. An example of a log line from 1758 is in a case next to the interactive. Sailors counted how many knots were in the sea before the time’s up. 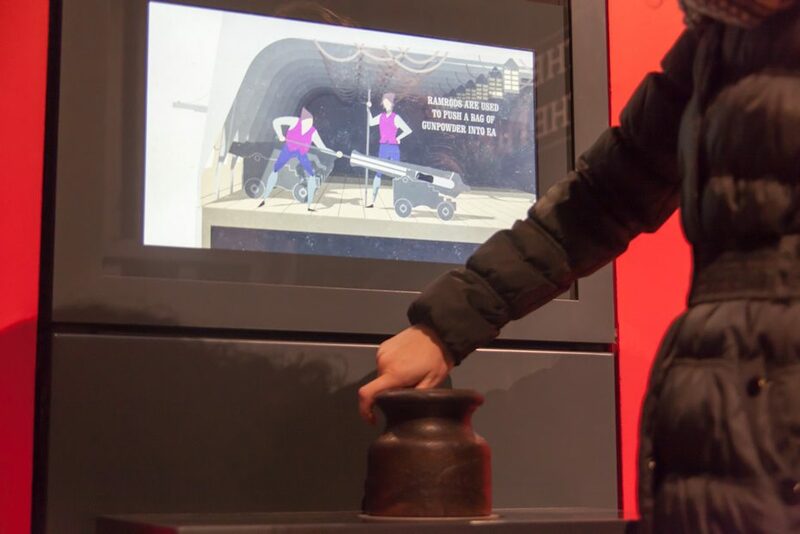 This is a straightforward interactive, designed to explain the origin of the word ‘Deadeye’ and the object’s use on a ship (a pair of Deadeye Blocks would be used to tension the ropes that held the ship’s mast). The various stages involved in loading a gun on a warship is explained with simple illustrations and short copy. Enough ramrods were needed to load each gun at the same time and spares too.